Manatee Memorial Hospital is a smoke-free campus. Each patient may have a maximum of two visitors in his or her room at a time. Visitors should be free of any symptoms of infection. Depending on the patient’s and/or roommate’s physical condition and emotional health status, the number of visitors and the length of each visit may be further limited by the nurse. 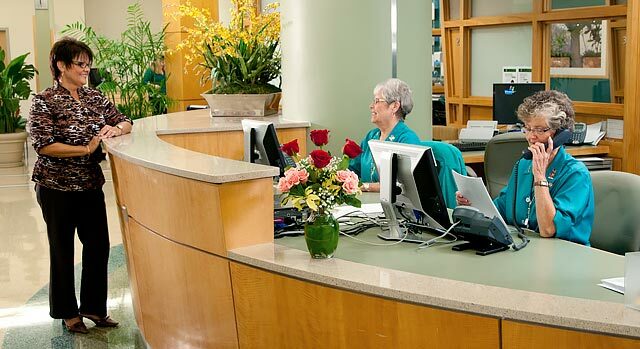 Visiting hours can be adjusted individually for patients staying in private rooms. Check with your nurse. Manatee Memorial Hospital wants patients and their families to participate in the patient’s care. However, please DO NOT take or administer care, food, or medication without speaking to the nurse. While in the hospital, patient care is strictly guided by physician orders. This includes the patient’s nutrition. Food other than that provided by the hospital’s Food and Nutrition Service is discouraged. Please check with the patient’s nurse to ensure that food items brought by visitors will not interfere with the nutrition portion of the patient’s healthcare. Special permission is necessary from the nurse in charge for visitors under the age of 12. Children should be free of any symptoms of illness and should not have been recently exposed to sicknesses such as measles, mumps, or chicken pox. All children must be cleared by the nurse before they visit a patient. Visiting hours for hospital departments are listed below. General Visiting Hours: 7:30 a.m. - 8:30 p.m. Please note: The entrance doors will be locked at 8:30 p.m. Intensive Care Unit - Coronary Care Unit - Cardiovascular Services Intensive Care Unit: Manatee Memorial Hospital has open visiting for these units. However, to protect patient privacy and ensure effective communication, visitors are not allowed from 7 a.m. to 9 a.m. and from 7 p.m. to 9 p.m. for Shift Report. Please do not call the unit during those hours to avoid interrupting patient care. Quiet time for patient rest is daily from 2 p.m. to 4 p.m.
For your safety, Manatee Memorial provides security patrolled, well-lit parking lots and a parking garage. For your convenience, a volunteer-operated shuttle van and valet parking are also available during weekdays. Disabled parking is reserved for those with appropriate government permits and is located near most hospital entrances. The parking garage is located north of the main entrance to the hospital (near the river). It is the most efficient location for patients and visitors to park. From the second floor of the parking garage, you may take the covered crosswalk directly to the main entrance of the hospital. The "Shoppe on the River" Auxiliary Gift Shop is located in the main lobby of the hospital and is operated by volunteers of the Manatee Memorial Foundation Auxiliary. The shop offers an extensive variety of gifts for your loved one, including get well and new baby gifts, balloons and beautiful flower arrangements. Complimentary wireless Internet access is available for patients and guests. Browser will display the Manatee Memorial Hospitality Wireless network Welcome Page. Click the “I agree” button on the left side of the page to accept the terms. Flowers are permitted in most patient areas with the exception of the Intensive and Cardiac Care Units and are available for sale in the Gift Shop, located near the tower entrance. For safety reasons, only Mylar balloons are permitted in patient care areas. The 2nd Street Bistro is located on first floor and is open daily, serving fresh and healthy food options. In addition to the Bistro, our staff prepares and delivers meals to patients in their hospital rooms, and caters events inside and outside of the hospital. Our team of trained and certified dietitians works with patients to aid their recoveries through nutrition. The Bistro offers a 15 percent discount to both members of Senior Advantage and WE—Women Enlightened for Better Health programs. Visitors are also welcome to dine in the hospital cafeteria. Vending machines offering beverage and snacks are located outside of the cafe, on the ground level opposite elevators C and D, and in the Emergency Department. They are available 24 hours a day, seven days a week. For your convenience, an automated teller machine (ATM) is located in the main lobby. Specialty coffees and a large variety of other drinks as well as snacks are featured in Starbucks Coffee Shop located in the lobby of the Main Entrance.